Investigators consider deadly explosion in Kerch to be mass murder | Russian Legal Information Agency (RAPSI). MOSCOW, October 17 (RAPSI) – Russian investigators reclassified a criminal case opened on Wednesday over a deadly attack in the Kerch Polytechnic College from an act of terrorism to mass murder, the Investigative Committee’s press-service stated. According to the latest information, the attack took lives of 17 people. Earlier, the Investigative Committee of Russia reported that 50 people were wounded and 13 died during the incident. Investigators announced that the assailant was identified as a student of the college’s fourth grade, 18-year-old Vladislav Roslyakov, who shot people present in the building and then committed suicide. Previously it was reported that an explosive device composed of metallic items detonated in a student canteen of the college. Russia's Presidential Council for Human Rights called for thorough and impartial investigation into the tragedy, according to the statement published on the advisory body's website. 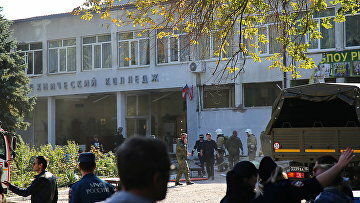 16:48 17/10/2018 Russian investigators reclassified a criminal case opened on Wednesday over a deadly attack in the Kerch Polytechnic College from an act of terrorism to mass murder.